The Universidad del Valle de Guatemala (University of the Valley of Guatemala (UVG)) is a private, not-for-profit, secular university located in Guatemala City, Guatemala. Founded in 1966 by a private foundation, it was the first private university in Guatemala to give a strong emphasis to technology. UVG has partnered with Development Ventures and Greenergyze, S.A. Development Ventures will serve as the technical lead on financial infrastructure activities. Greenergyze will lead the physical infrastructure activities. Small-scale producers from low-income agricultural communities Guatemala are among the most vulnerable actors in agricultural value-chains across the country. Suitable technologies, including irrigation systems and cold storage facilities, are readily available in Guatemala, however, there are three main constraints preventing producers from accessing them: lack of affordable clean energy to power facilities; lack of affordable finance for investment in clean energy power generation; and lack of skilled service providers who can sustainably operate services at a price-point affordable to producers. 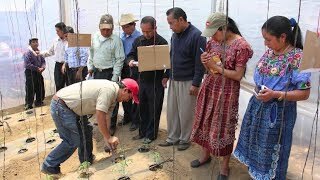 UVG uses an innovative approach to developing low-cost utility companies in agricultural communities in Guatemala that are not connected to the grid, called Community Accelerators. Each Accelerator will consist of a localized mini-grid and will be operated by a local service provider company that also provides agribusiness service. This “utility in a box” approach is designed so that private sector financing can be used to fund the establishment of Accelerators, making this clean energy solution scalable in low-income agricultural communities in Guatemala without additional donor funding. The project will facilitate investment into one agricultural community in Guatemala to power agricultural production/ processing equipment for coffee producing communities. The project team is currently designing and installing an initial pilot system in a community that will benefit nearly 500 people. The project has completed an extensive legal and technology development process and is currently starting the build-out of the pilot site. The integrated system for the project contains a complete minigrid solution for the community to power every home in the community and a de-husker to support communal coffee production activities. Future plans include training local producers, as well as seeking further investment for installing systems in other communities. UVG’s award has been extended to September 2019. Leslie Henry, legal representative for Development Ventures, a Universidad del Valle de Guatemala partner, will be presenting at the Microgrid Policy and Regulation Conference, which will be held on February 20th and 21st in Tegucigalpa, Honduras. Andrew Varrow of Development Ventures—a Universidad del Valle de Guatemala (UVG) project partner—will discuss how microgrids can help eliminate energy poverty in the developing world, and outline strategies for encouraging private-sector investment in community-level microgrids. The Universidad del Valle de Guatemala will be hosting an invitation-only event at the Organization of American States in Washington, D.C. covering their efforts to promote STEM education for students of all ages and educational backgrounds. Universidad del Valle de Guatemala discusses their plans for developing low-cost community utility companies in ‘off-grid’ agricultural communities called Community Accelerators in Guatemala. This project has been selected for a 2015 Powering Agriculture Award.